Directions: The entrance to Bellefontaine Cemetery [ Waypoint = N38 41.443 W90 14.118 ] is located at 4947 West Florissant Avenue in St. Louis, Missouri 63115. From the Reynolds grave in Calvary Cemetery, turn your car around so you are headed in a southwesterly direction. On the way back to the cemetery entrance, you should be running parallel to Calvary Avenue outside of the cemetery's boundary. On the way back, continue taking the left forks or left turns until your only option is to turn right. This should be about 0.4 miles from the Reynolds grave. After turning right, Section 12 should be on your right and Section 18 should be on your left. Take the first left. You will be passing the Daniel Frost grave site at this point. Turn left and you are now less than 0.2 miles from the cemetery entrance. Leave Calvary Cemetery and turn left onto W. Florissant Avenue. 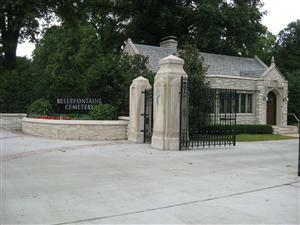 After about 0.3 miles, the entrance to Bellefontaine Cemetery will be on your left. Description: This tour will focus on four grave sites of interest concerning St. Louis and the Civil War. There are many grave sites of interest concerning the American Civil War in The Bellafontaine Cemetery. Be sure to stop in at the visitor center near the entrance to pick up a couple of the maps of the cemetery. One map is specific to the Civil War and the other map shows historically significant sites of a more general nature. For additional Civil War graves of interest in Bellefontaine Cemetery, consult William C. Winter's Civil War in St. Louis listed in the Tour's References. The roads in the cemetery are not always well marked. Try to pay attention to the road names as you try to locate the grave markers.